(by Ahmed Charai, Gatestone Institute) – Saudi Arabia, with the visit of the Saudi Crown Prince Mohammed bin Salman to the United States this week, opens a new front in its war with Iran. The visit is a collection of firsts. It is the first trip by Prince Mohammed bin Salman — known universally as “MBS” — to the U.S. since becoming the heir to the oil kingdom’s throne in June 2017. (President Trump’s first presidential trip to the Middle East began with a stop in Saudi Arabia.) 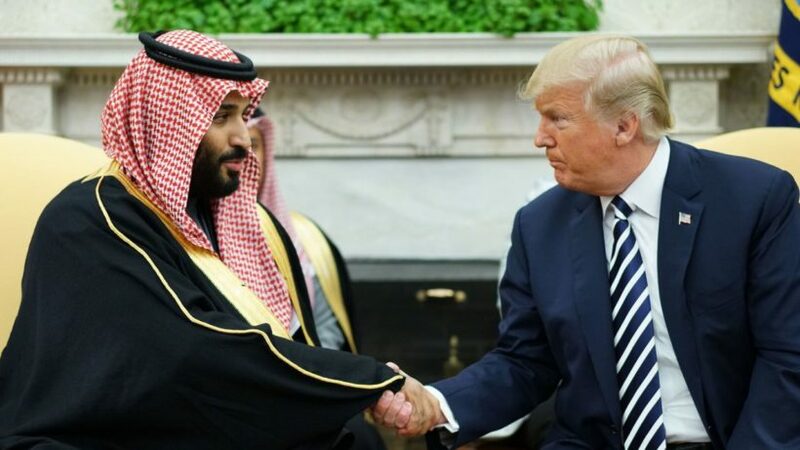 More importantly, it is the first time a senior Saudi official, let alone a ruling royal, will venture outside the U.S. capital to make official visits to Wall Street, Hollywood and Silicon Valley. Never before has a crown prince — especially one who runs Saudi Arabia’s government on a daily basis — come to America’s financial and cultural capitals to do business. Indeed, MBS is hoping to drum up support for his plan to offer five percent of ARAMCO, the Saudi oil producer, to Western investors as well as to make investments in software upstarts and media empires. This is a Saudi royal who sees no division between commerce and statecraft, between diplomacy and investment. While much has been made of MBS’s opening “drivers ed” schools for women (which quickly attracted some 70,000 students) as part of the kingdom’s June 2018 move to allow [some] women to drive, the domestic reforms have been far more rapid and sweeping than the conservative kingdom has ever seen. Perhaps the most dramatic reform is the one that has received virtually no attention in America. The crown prince has led an effort to sweep out the Muslim Brotherhood from teaching and leadership positions in elementary, middle and high schools as well as colleges and universities. The Brotherhood, founded in Egypt in 1928, has been the birthplace of nearly every radical Islamist group in the past century — from Egyptian Islamic Jihad to al Qaeda. The Brotherhood came to power in Cairo, following the departure of Hosni Mubarak, and only lost its grip due to a Saudi-funded coup. Inside Saudi Arabia, the Muslim Brotherhood’s intellectual and financial influence is vast. It has shaped the thought of at least two generations of Saudis, and it counts many allies among the kingdom’s 15,000 princes and even more among its 20,000 major clerics. It also has a literal army of armed supporters. MBS is kicking a dragon and he knows it. The stakes of his fight with the Brotherhood could not be higher. If MBS succeeds, Saudi Arabia returns to pre-1979 roots, with movie theaters, women in the workplace, and features of a modern developing country. If he fails, he will be killed by the Brotherhood and Saudi Arabia will become more repressive than ever. The global stakes of MBS’s internal fight with the Brotherhood are large, too. If the crown price wins, nearly all Saudi funding for violent Islamic radicals ends — and if he dies, it grows to new heights. MBS is betting his life that he can reform his country and offer it a future beyond its dangerous dependency on oil. He wants to build 18 nuclear power plants over the next two decades, thereby safeguarding his nation’s electricity prices from the rollercoaster of world oil prices. He wants to diversify the economy, allowing men and women to leave their subsidized and static lives for new roles as professionals, executives and entrepreneurs. His “Vision 2030” is the biggest planned change in any country since Turkey’s Ataturk or Singapore’s Lee Kuan Yew. And Saudi Arabia is larger in terms of both people and land than 1920s Turkey or 1960s Singapore. If he succeeds, his achievement will be studied for centuries. America should get behind MBS’s bold vision — it is the best roadmap for regional peace and security as well as domestic modernization. Published March 21, 2018 at gatestoneinstitute.org. Reprinted here for educational purposes only. 1. a) What reform by Saudi Crown Prince Mohammed bin Salman (known as MBS) has not been reported on in the U.S.? b) Why should this be big news in the U.S.? 2. How will the potential success of this attempt by bin Salman change the course in Saudi Arabia? 3. The purpose of an editorial/commentary is to explain, persuade, warn, criticize, answer, entertain, praise or inspire. What do you think is the purpose of this editorial? Explain your answer. Wahhabism is the dominent form of Islam practiced in Saudi Arabia, and is spread by the Saudis around the world through the funding of mosques and schools including in the U.S.
Wahhabism is an extremist … and violent movement that emerged, with the pretension of “reforming” Islam, in the central area of Arabia in the 18th century. Wahhabism … (including the Egyptian Muslim Brotherhood and the Pakistani Islamists) is the main source of Islamic extremist violence in the world today. Just as there are many denominations of Christianity (such as Catholic or Protestant) or Judaism (such as orthodox or liberal) there are a number of denominations of Islam. The major denominations of Islam are Sunni and Shi’a. Wahhabism is a sect of Sunni Islam. Saudi Arabia: What About the Hate-Filled Textbooks and Sermons?